Here is the short edit of the Wheeler Peak ski via the normal western route. This descent was done in May of 2014. I first tried to descend via a gully direct off the summit however the recent snowfall covered sharp talus fields connecting the summit to the gully. 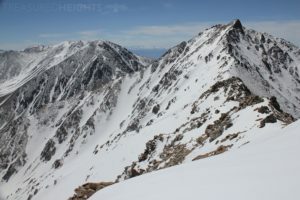 The eastern side of the peak clearly has better snow, however the approach is far longer than the approach from Taos Ski Area side, this makes the route I chose the most popular. This being said New Mexico does not have a large bc skiing community so it is not crowded like Front Range peaks in Colorado or the Tahoe region. I’ll put out an article with more details in the near future. See the Facebook page for release news.